What is an IP address? Well in layman terms, an IP address is the unique address, shown in numbers and assigned to a particular computer which is connected to the Internet. There are instances you might want to hide your IP address in order to purchase stuff from the Internet or fill in online surveys or do some other stuff. There are instances I need to hide my IP address if I want to purchase stuff from websites that do not accept Nigeria, and since the billing address on my Visa card reads the U.S. , I would have to hide my I.P address which probably specifies Nigeria. Sometimes I could be lucky and the cafe I might be using might already have their IP address from another country other than Naija. Go to http://www.ip-adress.com/ipaddresstolocation/ , once you do that , your IP address and location would be shown automatically. If you see it is reading Nigeria and you want to hide do the next step. go to www.2hide.net . 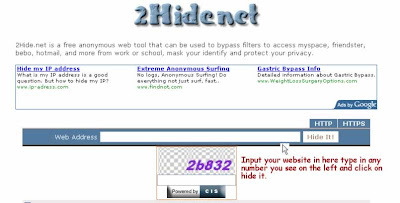 When you get there, Input your website in the address bar, type in the numbers you see and click on hide it. When I think about the power of the Internet I wonder why some people still complain about not having jobs. Do you know that you can work for someone in a different country e.g. in United States while you are here in Nigeria and be paid in U.S. dollars? Do you know that you can even fix the amount of money that can be paid? Do you know that there are websites that would bombard you with work you would find it hard to even keep up with the volume of work. The Internet allows the skilled professional to become a highly paid freelancer. What is Freelancing or who is a Freelance? A freelance is somebody working for different companies: a self-employed person working or available to work, for a number of employers, and usually hired for a limited period. Therefore Internet Freelancing is the act of working for someone through the Internet. Hello guys, I just came across this video on list building. For those who have attended the Affiliate course at the Academy, this will make a whole lot of sense.